Patterned cotton apron in Creamy Beige. With inspiration from Ingrid Bergman´s Italian period, we created the Isabella line with printed yellow, ripe lemons and pink lemon flowers on a creamy beige background. Made in 100% cotton, Isabella comes in two different qualities where the runner together with the cushion covers, tablecloths, and napkins have a slightly coarse structure and the seat cushion, tea towel, apron, oven mitt and pot holder are of a smoother weave. The Isabella series fits perfectly together with Linum classics lines like leather Fuego, half linen Hedvig and cotton Sara and Slussen. 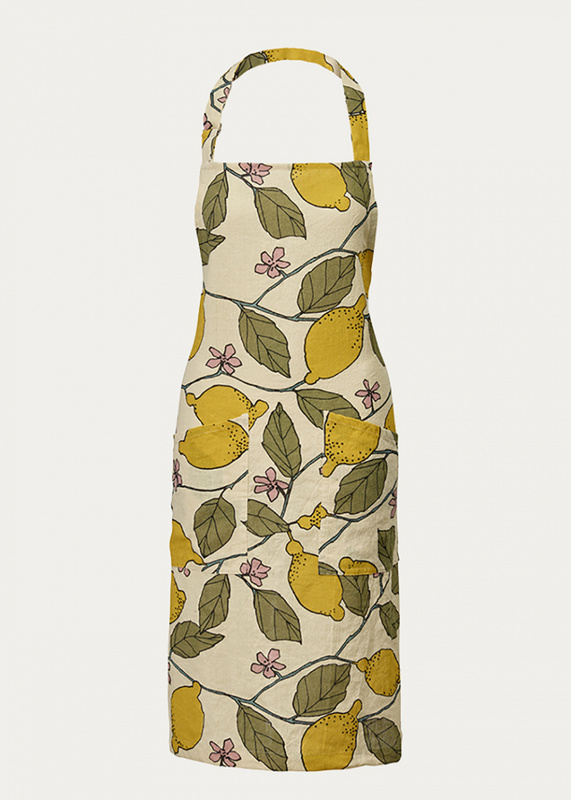 Isabella apron comes with adjustable neckband and two pockets.